Learn 1000's of tips, tricks and marketing techniques in just a few nights of easy reading. Jeffrey Dobkin's articles on marketing have been featured in over 300 magazines. Learn what makes his marketing techniques to easy to learn and yet so effective. All written in his brilliant conversational style. A complete direct campaign written in the brilliant conversational style of master copywriter and marketer, Jeffrey Dobkin. If you're marketing a product or a service you need to have this reference tool in your hands… sooner than later, and you might as well order it now —— start learning the real low cost way to market. Learn how to create successful direct mail and responsive ads; learn where to dig out markets and locate the media that reaches them. This is an update of the cult classic, How To Market A Product for Under $500: same information but with a little looser treatment of the financial aspect. 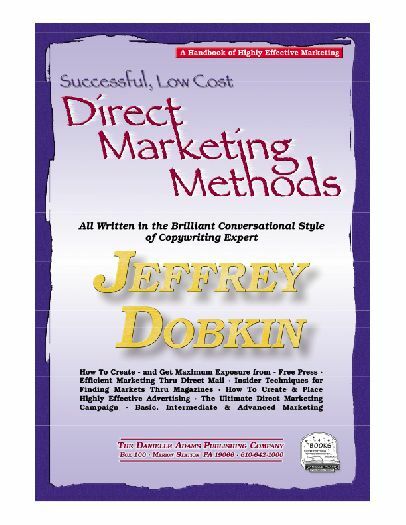 Jeff Dobkin is the authority on low-cost marketing methods. Order this e-Book — a wonderful value: easy to read, information is logically presented and in in-depth form. It's a complete manual - everything you need to know about Marketing, PR, Direct Mail, Advertising. For doing it yourself or working with agencies. Order now, immediate download delivery.